Walking distance to the Disneyland® Resort park gates: 1.4 miles. 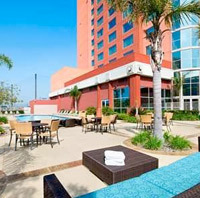 This hotel is an all-suite hotel located one mile from the Disneyland Resort. The 375 guest suites in an exotic jungle theme and feature two rooms with a separate living room, two televisions, microwave, refrigerator, in-room coffee/tea maker, hairdryer, iron and ironing board. Hotel amenities include a lush atrium, swimming pool, spa, gift shop, restaurant, lounge, fitness center, game room and guest laundry.